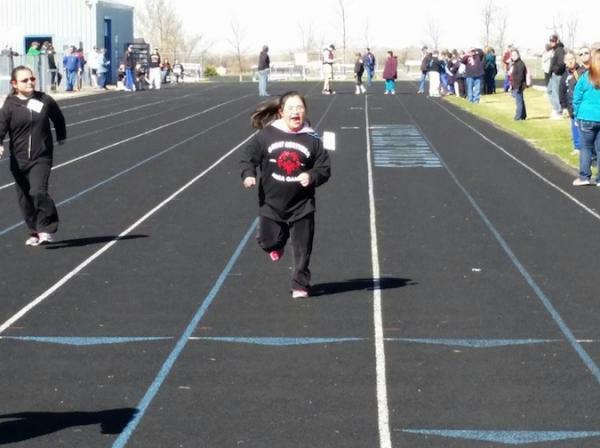 Sway-Anne Byrd, Cherokee, is a 14-year-old competitor in the Special Olympics. For the third consecutive year, Sway-Anne Byrd will compete in the Area Special Olympic Games in her hometown. But for the 14-year-old Cherokee girl, who lives in Havre, Montana, this year’s games will have some added significance. That’s because the teenager, who was born with Down syndrome, will carry the torch during the opening ceremonies of the Games, which will be staged on Wednesday. As she did a year ago, Byrd will participate in four track and field events at Wednesday’s games. She will run in the girls’ 50-metre and 100-metre races in her age group. And she will also take part in the standing long jump event and the softball throw (the shot put equivalent for Special Olympians). At the 2014 games, Byrd captured gold medals in her 50-metre race and standing long jump. And she won silver and bronze medals in her 100-metre and softball throw events, respectively. “She really enjoys it,” said Byrd’s mother. This entry was posted in News, Sports and tagged Cherokee, Native America, Special Olympics, Sway-Anne Byrd, teen, torch by Kim Kalliber. Bookmark the permalink.